Required Reading is DoomRocket’s love chest, opened twice monthly to champion a book that we adore. This week Arpad recommends the hardcover edition of Joe Casey & Benjamin Marra’s ‘Jesusfreak’, available now from Image Comics. by Arpad Okay. Jesus is well-trod territory. Jesusfreak, on the other hand, is something that hasn’t come before. Jesusfreak is struggle turned to violence. Martial arts violence. Demon lizard monster violence. Explosions of blood, rending of limbs, fire eating bodies down to bubbling pools of wet. This is a path of discovery few walk and fewer survive. Here, Jesus doesn’t just look like Conan the Barbarian, he acts like him. Add a healthy dose of politics, some racial and religious suppression. Read it twice, or more, read it every Sunday, for its mysteries are buried deep. Jump to psychedelic visions of screaming mouths, serpents, and flames that look straight out of a Ghana movie poster as much as a Florentine fresco. I can’t get over Jesusfreak’s repeated appearances of hulked-out alligator men. 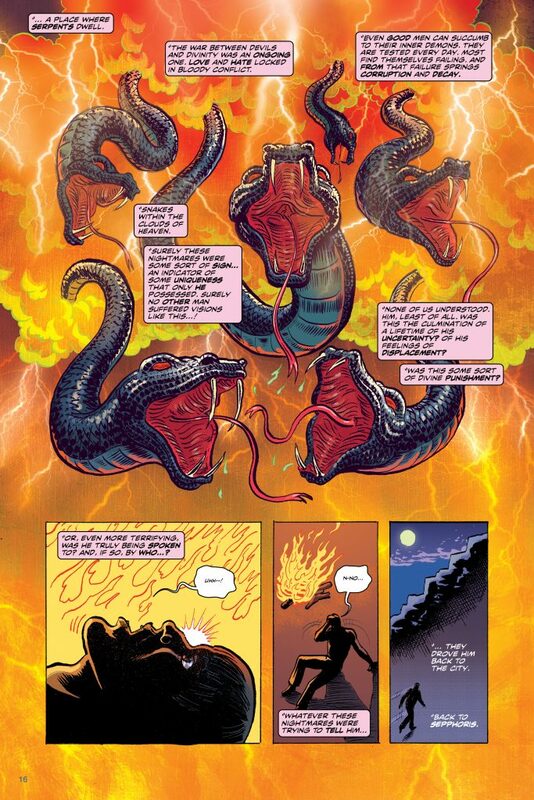 Snakes battling angels. And then, in the waking world, Jesus talks to lizards, and they talk back. A large part of that is the aesthetic mishmash of the art. Martial arts poses between Roman columns, colored with shapes and patterns that feel like 60s mod designs, like Jim Steranko’s S.H.I.E.L.D. covers. 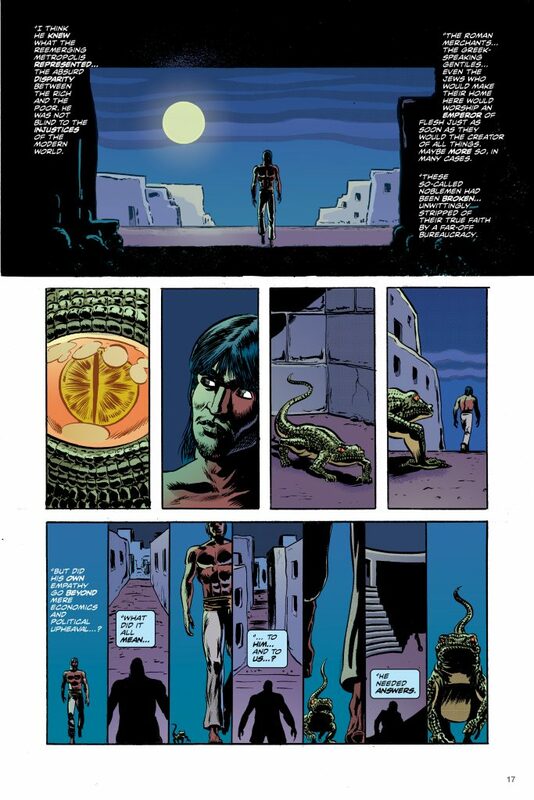 Joe Casey has written the first Bible adaptation full of ripped, shirtless dudes with hair like the Stooges and MC5. The shag is thick and so is Casey’s politics. Imagine a world where a power structure feeds the top only, a corrupt value set that oppresses any “other” it can’t get to work as a slave until death. Poverty and fear breed empty contentment in the masses. Jesus as a Light in the Darkness. The Light is you. The Darkness, also you. Casey hits hard on the idea that the divine lies inside, playing with the idea that mind and body come together in combat. Blind violence is a spirit in conflict. However, when confronted with evil, ultimate evil, evil within: smash it. 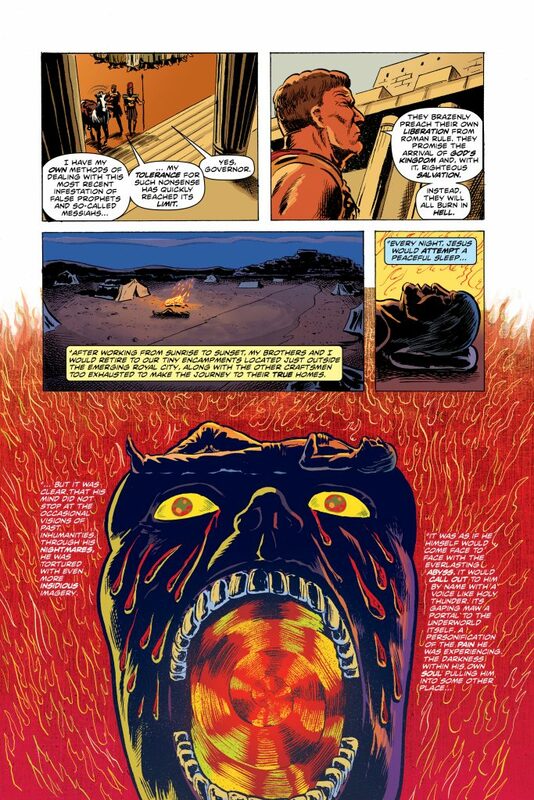 Benjamin Marra’s illustrations are right there, just as extreme and crushing. Jesus is some kind of Metallica muscleman with fingers bent at crazy angles, a coldblooded jump kick out of a juvenile delinquent’s notebook. His heavy blacks and fine touch of brush texture feel strongly of classic EC comics. Grizzled faces, bloody mouths, frowning, teeth bared. Mirror pools of blood. Fire of sin. If Bernie Krigstein ever did the Gospel of Mark, this is what it would look like. 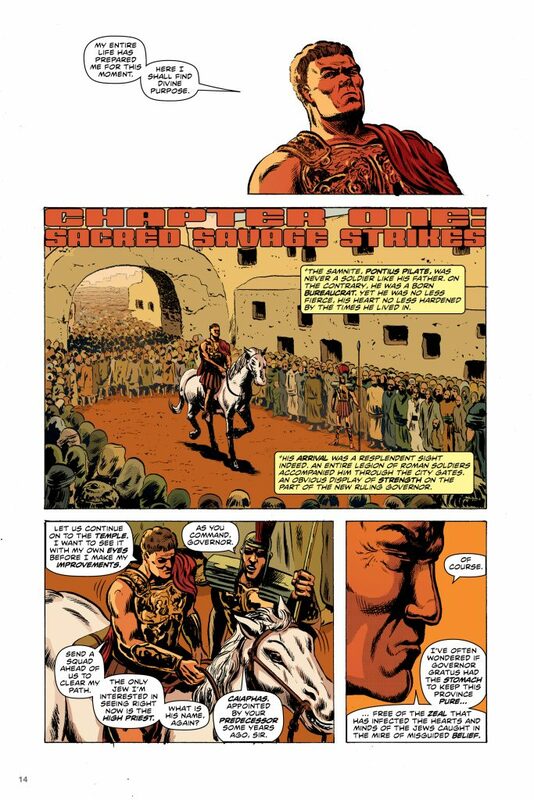 Jesusfreak’s unreal, desert-inspired palette from Brad Simpson lets you know this comic is unmistakably made today. Every page has a restrained glow to it, faded with photokeratitis. Luscious is the ochre, monarch, amber, bronze used for skin tones. Simpson paints vivid and bleached simultaneously. Rus Wooton’s letters do some serious heavy lifting. Jesusfreak contains an ocean of text. Wooton’s clear, concise fonts make the quantitative reading effortless and stylish. The titles in Jesusfreak are where Wooton flourishes, total Enter the Dragon sword words, but every page benefits from his hard work. Jesusfreak isn’t the whole story; it’s a pivotal moment in Jesus’ life, the failure that transforms him from a troubled craftsman into the Messiah. A confrontation with enemies within and without, with power. The darkness and violence of all men, the will to oppress, bloodlust. Man: the bottomless pit that is his thirst for dominance. The irony that Jesusfreak is trying to tell a parable of how bad our modern age is using an intrinsic piece of the power structure it rails against is not lost on me. Throwing cool colors and decapitations into the Gospels can’t get away from the fact that Christian intolerance for change is a big factor in why history repeats itself. But Jesusfreak posits denying others so that you can rise is true sin, and that the natural order of things, the will of the saints, is to shake sin down to its very foundation. Casey & Crew’s Jesus knows violence is an answer because it is the destruction of evil. Watch Jesus kick-punch-flip-stab his way to the center of moral quandary. Can he fight his way back out? 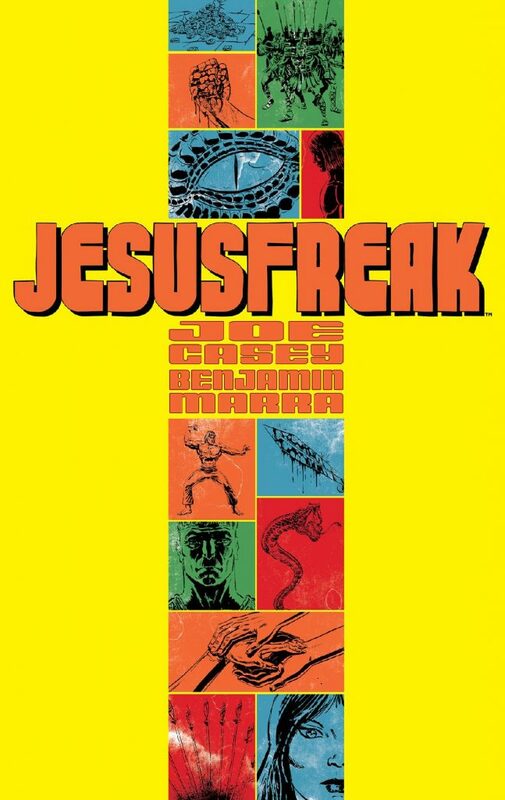 Enjoy this 5-page preview of ‘Jesusfreak’ HC, courtesy of Image Comics!